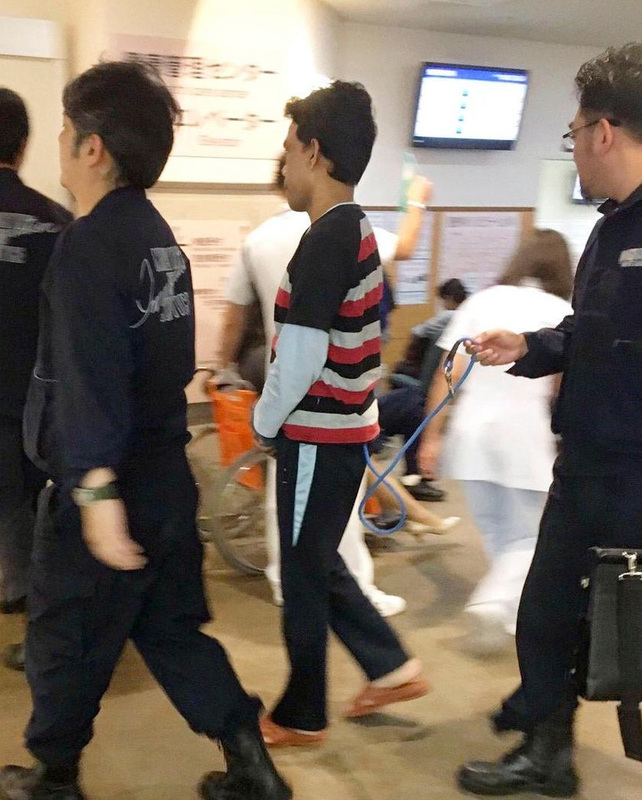 Photos of a Bangladeshi asylum-seeker being taken to a Japanese hospital while roped and in handcuffs have sparked an online debate on the treatment of foreign people detained at immigration centers. 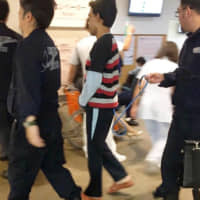 The images of a cuffed Mahruf Abdullah walking inside a hospital accompanied by uniformed immigration officials, with one of them holding a rope tied to Abdullah’s waist, were taken by a hospital visitor in October and have since been posted on social media by Asahi Oda, a supporter of immigration detainees. Abdullah, 36, agreed to be named and to have the images shared, saying he hopes to let people know how people like him are being treated. “I am not a criminal,” he said, saying the handcuffs and rope were humiliating. The asylum-seeker had his waist and knees examined by a doctor, and the Tokyo Regional Immigration Bureau said the handcuffs and rope were necessary to prevent him from fleeing. Japan can keep asylum-seekers without a legitimate visa status at immigration detention centers as preparation for deportation. Those who are clearly deemed not to meet the requirements, or who have applied many times for asylum in initial screenings, can be detained. The Immigration Bureau said it applies handcuffs and a rope to detainees in accordance with a Justice Ministry ordinance, but it also takes measures to prevent detainees from being seen in public in such restraints. In the photos, Abdullah’s handcuffs were covered. The bureau said the images in question made it appear as if he was exposed for some time to public view but that they only captured one scene from the visit. In 1995, the Osaka District Court ordered the state to compensate a Japanese defendant in a criminal trial who was taken to hospital in handcuffs and a rope, recognizing it as a violation of personal rights. The ruling was later upheld by the Supreme Court. The Justice Ministry’s Correction Bureau said it tries to keep hospital visits by inmates and detainees away from public view by making its officials change out of uniforms and enter medical institutions through back doors. “The human rights (of those held at immigration centers) should be protected as much as or even more than criminal defendants” who are presumed to be not guilty until courts find them otherwise, said Yasuzo Kitamura, a professor of international human rights law at Chuo University’s law school. The detention of foreign nationals at immigration centers is based on administrative rather than criminal procedures, he said.